Sorry I’ve been away for a while ^^’, I’d like to say I’d been somewhere nice but it’s just been a case of a hectic chaotic life overtaking everything lol. Well I’m back and on time for a change lol. I would say Chicken Tikka Masala is the thing I order the most when I’m out in local restaurants. As you know I cook it quite often myself and have done for Wheelie Good Meals, you can find the recipe here so thought this was a good one to try. 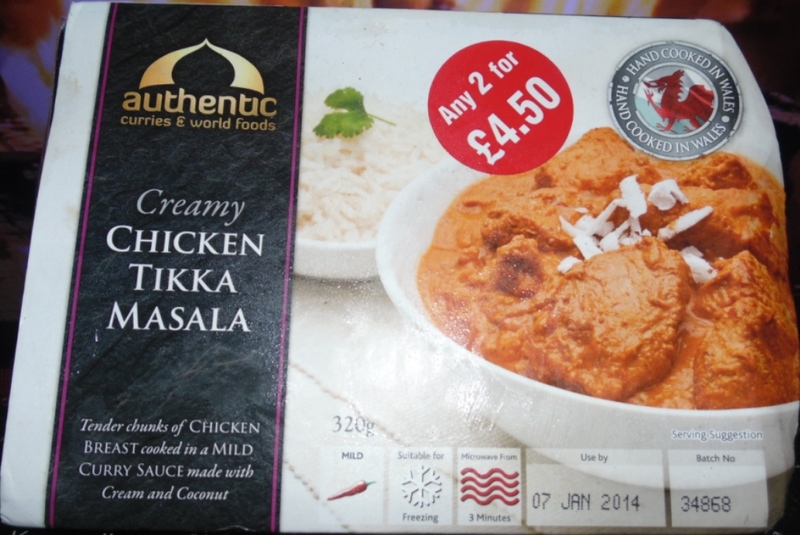 The other reason I wanted to try it is I live near the company that make it and I used to eat in a local pub on karaoke night (not a chain pub I hasten to add) and they’d serve these curries. Tikka Masala is seen by the public as an Indian dish, however it’s not! 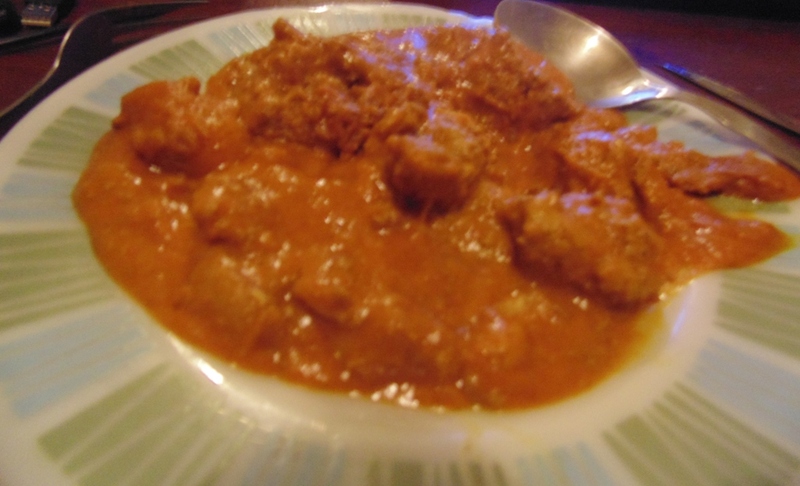 If you’ve read my earlier post where I gave the recipe for my left over Chicken Tikka Masala I’ve explained the story behind the origin that I like the most states that it originates from Glasgow. Apparently a bus driver coming off shift went into an Indian restaurant in Glasgow and ordered a chicken curry. He apparently sent it back to the kitchen complaining that it was too dry. The chef proprietor added some tomato soup to the curry with some spices, sent it back to the customer and he absolutely loved it. The bus driver and his friends came back again and again; therefore, it became a regular on the menu of that restaurant and spread throughout the country. Tender chunks of CHICKEN BREAST cooked in a MILD CURRY SAUCE made with Cream and Coconut. 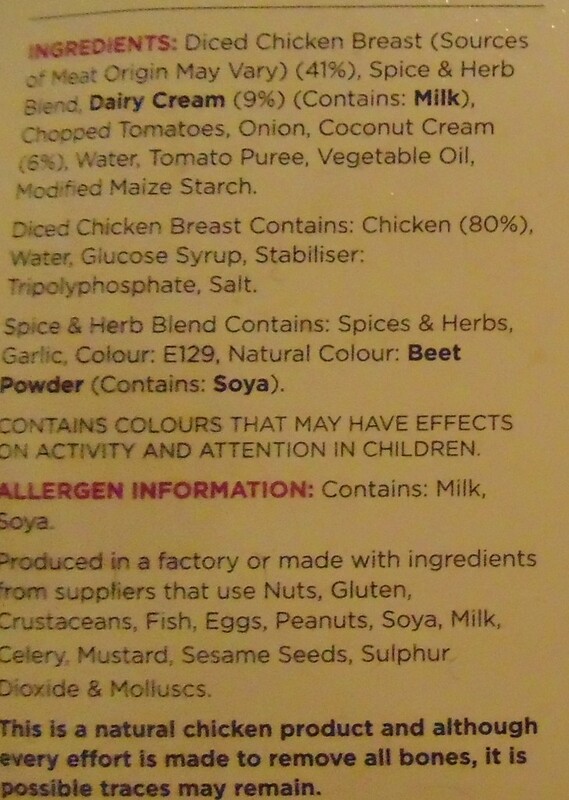 I (because I’m a plonker) didn’t realise this dish didn’t come with rice so…. I didn’t cook any, doh! 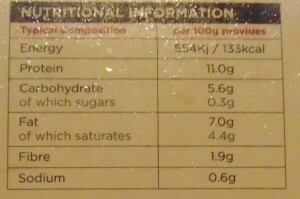 That’s probably my only real improvement is that it would be nice if it was a full ready meal…. 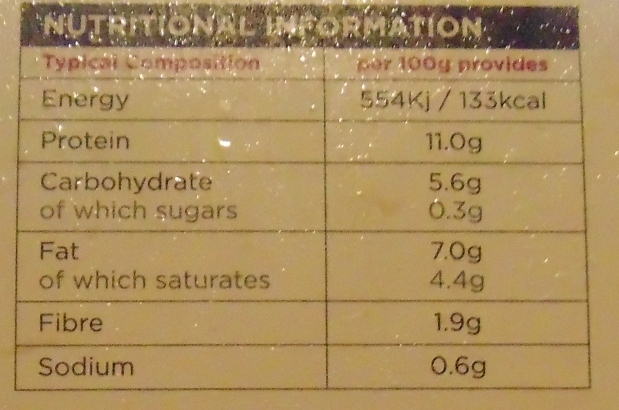 in saying that it doesn’t take long to boil rice… if I’d have read the ingredients list properly I’d have realised. Like the ingredients and the allergy information I thought the nutritional advice was also clear and concise (see picture below). 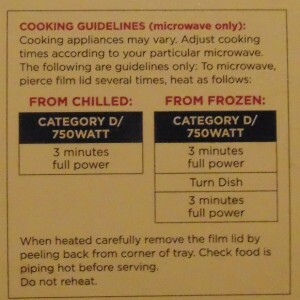 The cooking instructions were very clear and concise (see below). 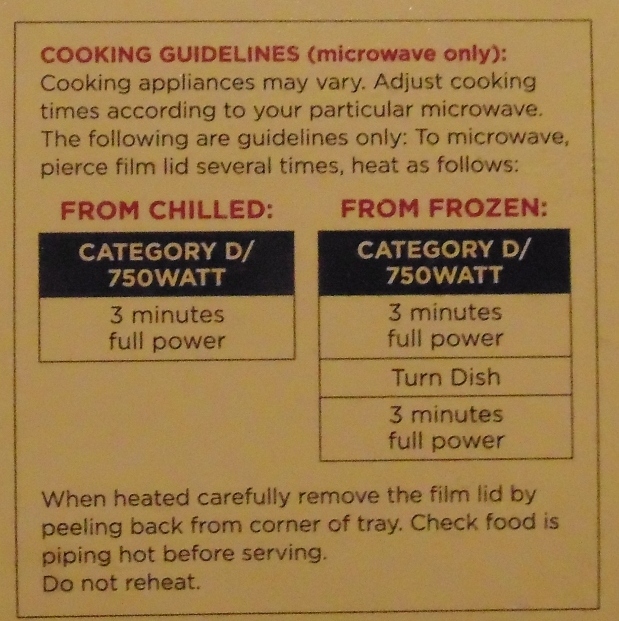 However, I suppose my other observation would be that the cooking instructions only cater for the 750W microwave and where chicken is concerned you need to know exactly how long to cook it for. I know the pack wouldn’t be big enough for every different type of microwave but it would have been nice to maybe have 750W, 850W and 950W. As you know I have a 700W so with those other timings I could have worked out exactly how long to leave mine on, instead of guessing. This, yet again, was a fantastic ready meal and one I most certainly would have again. It evoked lots of memories of nights out and was warm and comforting… exactly what you want at this time of year. 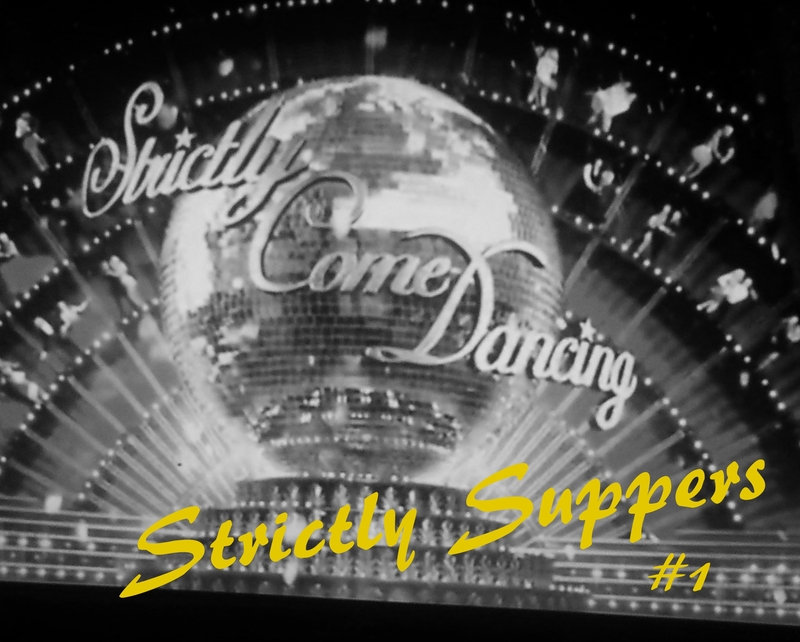 Keep your eyes peeled for a Ready Meal special next week — Sainbury’s Chicken With A Creamy Vintage Cider Sauce followed by Belgian Chocolate Soufflés washed down with a 2014 South African Dry White (yes you’ve guessed it another one from Heather 🙂 ). Don’t forget to subscribe to the blog and visit us on our social networking page. Come back again soon and, together, we’ll make more Wheelie Good Meals. 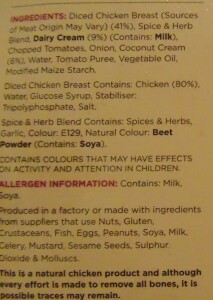 I think that’s the risk, there is a lot of other things that go in to a takeaway curry which are unhealthy. Thanks for stopping by!